As much as I hate having things around the house that we don't use, I sometimes really want the most obscure and impractical things. Like egg cups. They make me think of that scene in Ever After where the stepmother is tapping on her egg at breakfast. "...After all that I do! After all I have done! It's never enough..." Egg cups just seem so elegant and wonderfully impractical. I saw one at an antique store this past Saturday, but it was kind of ugly. And there was only one. So I didn't buy it. 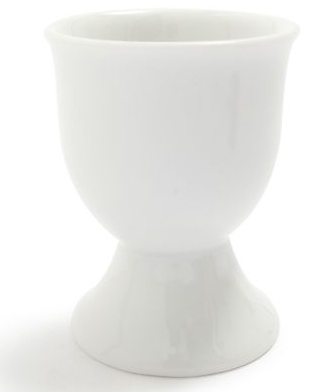 Honestly I don't even like eggs, so I don't know why I want egg cups so badly. I think I just would like the option of offering overnight guests a hard or soft boiled egg for breakfast, knowing I can serve it to them in a cute little egg cup. Here are some of the ones that I like. hahah this makes me laugh so much! you are so cute and i would love to come visit you and eat an egg out of an egg cup!